Coastal Luxe Cushion Covers for your lifestyle. I created The Coastal Cushion Company in 2015 so that customers can obtain beautiful cushion covers at affordable prices for their home, apartment, beach house, office, gift or for any reason! Numerous designs to choose from. From Darwin to Perth to Tasmania to Adelaide to Port Douglas and everywhere in between this great land. "You don't have to live by the sea to give your home some coastal style." ​Once payment receipt notification received, parcel will sent immediately and email notifying buyer. Cushion inserts are found at Pillowtalk for example for $6.95 each. These are lovely with a soft microfibre cover. 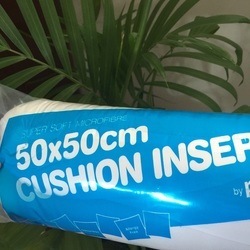 For a plump cushion that is full and stylish, I recommend size 50cm x 50cm for the insert. Also customers have given me great feedback on IKEA feather inserts (pictured above) and I have used them personally. EURO SIZE - the best insert size to buy is 65cm x 65cm to give my 60cm x 60cm cushion cover a luxe effect. OBLONG SIZES - the best insert size to buy is 55cm x 35cm to give my 50cm x 30cm cushion cover a luxe effect.